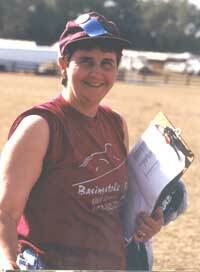 Volunteers are the life-blood of a Horse Trials. Here at Basingstoke we have super volunteers and wish to take this opportunity to publicly thank them. Volunteering at a Horse Trials is a tremendous opportunity to not only give back to the great sport of eventing but to also increase your knowledge of this complicated sport - and it's great fun, too! My husband, Bill, my very best volunteer ever! Volunteer work at a Horse Trials can take place before the event in many cases. We have fun doing all sorts of jobs. Even setting up a dressage ring! Here's two of our best volunteers, showing off their spiffy designer outfits during stadium jumping. Sometimes, volunteering at Basingstoke Farms entails hanging out in the shade. One of the best volunteers in the whole world - Norine Blanton. There are many other wonderful volunteers who regularly come out and enjoy themselves at Basingstoke Farms. Carol Ogden has proved to be a great Basingstoke Volunteer by moving jumps, promoting the farm, running stadium, recruiting other volunteers & by being just an all-around great friend. 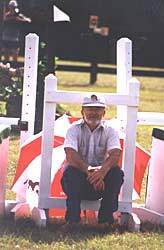 Barbara Algaier and Gene Chewning are two of our very best jump judges. Barbara very often surprises the other jump judges with cakes and other goodies at the party after cross-country. Scott McClung very often can be found as Safety Coordinator and/or jump crew. Scott and Ty McClung are not only invaluable during the event but can very often be found building jumps before the event as well. The McClungs are lifelong Patrons of Basingstoke! Many other generous and dedicated people make up the volunteer base of Basingstoke Farms. We could not run without them! I hope each and every one of you realize how special you are. If you would like to join this fabulous group of people, have a great time, get fed lunch, get a T-shirt or other little goodie, get our undying thanks and the chance to do it again and again, please contact us immediately! From time to time the eventers and/or drivers who volunteer from us also receive Free! schooling at Basingstoke. We are constantly desperately searching for jump judges and hazard judges for our driving event. Volunteers are usually needed from about 8am to about 5pm on event days and there is always a party for all volunteers and competitors directly following the competition on Saturday. We will teach you everything you need to know the morning of the event--all that is necessary is a willing attitude, a lawn chair and the ability to enjoy watching horses run! You may e-mail us (info@basingstokefarms.com), or call us (352-542-2755). We will be very glad to hear from you.